If you wish you had a whiter, straighter, and more dazzling smile, our Fort Worth dental office can help. Dr. Tillman has years of experience with cosmetic dentistry and offers a variety of popular services to create beautiful, natural-looking results. If you hesitate when you smile, or you struggle with self-confidence, let us talk to you about what a smile makeover can help you accomplish. Invisalign is a cosmetic braces system that can help you achieve a straight, beautiful smile without the need for metal braces. Instead, it uses a series of trays to help you move teeth into their ideal position. 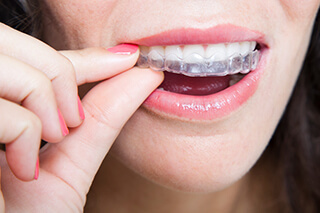 If you have been putting off orthodontic care because you didn’t want to wear traditional braces, let Dr. Tillman talk to you about the benefits of Invisalign. If you hide your smile because of embarrassing stains, teeth whitening will create a whiter smile for you. With chairside bleaching or an at-home whitening kit, Dr. Tillman can help you dramatically improve the appearance of your teeth, so you’ll feel more confident. Which option is most right for you? We would be happy to discuss your options during a consultation visit at our Fort Worth office. Veneers and Lumineers both use thin pieces of high-quality dental porcelain to help you hide flaws like stains, cracks, chips, and even misalignment. They are placed over the front of teeth to create natural-looking results that are stain-resistant and long-lasting. The only difference is that porcelain veneers are permanent and require the removal of some surface material from your teeth. 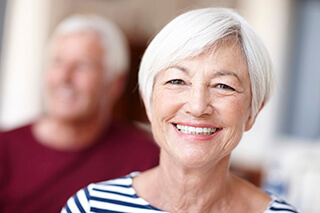 Lumineers are thinner and can be removed later if you decide to return to your natural smile.